I’ve finished the second book and I have to say I’m quite pleased with the results. At first, when I completed this book I wasn’t satisfied with it. But after going back and rereading it, I was pleasantly surprised by how much I actually enjoyed it. I’m more than a third of the way finished with this book. I’m so excited!!! I think this one will be my favorite. I expect to be finished with this book by summer. This project is in development, I’ve already plotted out the basic outline of the series. I’m excited to bring this line on board to complement the Eaa series. Sally Singletary will be an integral part on illuminating the events that take place on Earth in Billy’s absence. The series will have an X-Files, Fringe kind of feel with a bit of Nancy Drew thrown in. It will be a bit more on the darker side of things, the characters, the story, and the content. Definitely not for kids. I think this series will be my pride and joy. I’m very excited to announce that Book One of the Children of Eaa (working title) is now complete!!! (Now you know what’s been keeping me so busy.) I will give you more details on this book soon. 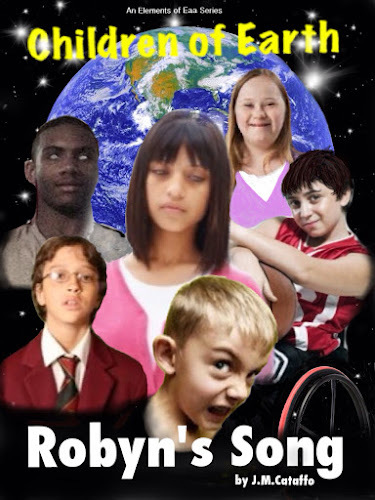 The basic premise is that a group of kids with disabilities at a Middle School discover unique abilities. Because of the nature of their disabilities and the events that take place, the abilities are a complete secret. They must work together to maintain their friendships and help to uncover the truth of their gifts as well as save a few lives along the way. This will be a middle grade series, but is also tied into the overall plot of the Elements of Eaa series. While this one will stand alone much more than Sally Singletary, it will tie into events that take place in both the previous two series. No word yet on publication dates for any of the books. I will be attending a Writer’s Conference in May where I hope to pitch the books to agents. I’m hoping after the first book is professionally edited that it will garner more interest. Thanks so much for all of the support and I will keep you posted. 2012 is the year I hope to see this book make it to print!!! Wish me luck!! !